My husband was like this. School had relatively no impact on him, positively or negatively. Except he liked band and his band director. But his draft number was 3, and it was 1968 – so he left twelfth grade mid-year for Viet Nam. He had never been an extroverted child and his family had no spare money for spring break trips or loads of extracurriculars. School was just something to get through – until your Real Life started. I had a different experience. I was social and extroverted. A little too chatty for most classrooms though. I often found myself at odds with my teacher even though I was engaged and smart. This wrestling for power went on for years. So by the time my teen years rolled around, I was quite comfortable with my teacher’s disapproval. Add in a little righteous indignation for being asked to do so many mind-numbing activities and using their authoritarian approach on me. Like my husband, school was a place that had to be endured. Inevitable. Or so I thought. What about my compliant peers? There were, of course, those who played by the rules and often excelled. Top grades, gold stars, class ranking… such was the currency of these students. 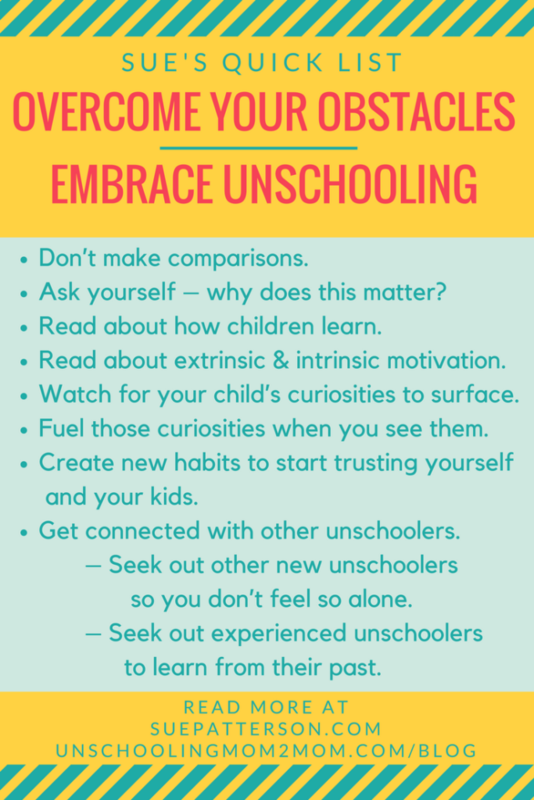 It makes sense that these students grew into parents who have a harder time with unschooling. They enjoyed their school experience, figured out the system, and churned out what the teachers wanted – at just the right volume and intensity. Most likely they were unaware of the problems others faced in their classroom settings. Or they may have been conditioned to scoff and feel superior. Whichever history fits you, know that we all carry baggage from our past experiences. Some of it helps us with risk-taking and pushing the boundaries of The Box, while others have trouble shedding the comfort of their hard-earned status. Even when it’s behind them. But then our own children enter the picture with their own strengths and skills for navigating their world. Do we encourage them to be creative and brave? encouraging some steps but not others. Yearning for safety and approval. It all depends on the lens we look through, right? 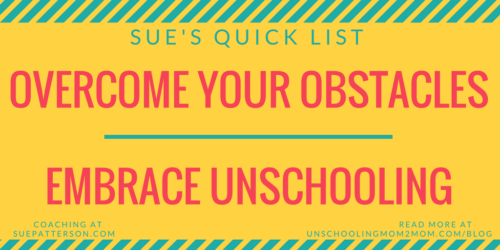 It’s been fairly clear to me after years of helping families, who will have more obstacles on their unschooling journey. Not that you can’t unschool if you fall into the first category – but you’ll face more obstacles and probably need more deschooling. It just makes sense quicker to the other category – they’ve been ready to cast off the shackles of school for some time! Again, just the lens you’re looking through. But lenses are typically clear glass. They just need a little cleaning to get rid of what doesn’t serve us (or anyone else) anymore.